TOKYO (AP) -- The combined bid of baseball　and softball were among eight sports shortlisted Monday for inclusion in the 2020 Tokyo Olympics. 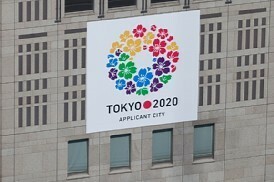 Tokyo Olympic organizers selected the eight from a list of 26 sports that had applied for inclusion. The other sports shortlisted are bowling, karate, roller sports, sport climbing, squash, surfing and the martial art of wushu. Baseball and women's softball was considered a favorite because of the popularity of those sports in Japan. "This is a great day for our sport," said Riccardo Fraccari, president of the World Baseball Softball Confederation. "Today baseball and softball -- and the millions of athletes and fans who call it their sport -- reached first base." The federations of the eight sports will next make a presentation in Tokyo on Aug. 7-8, and organizers will make recommendations for inclusion to the International Olympic Committee by Sept. 30. The IOC will make a final decision on which sports will be added in August 2016, when it meets ahead of the Olympics in Rio de Janeiro. Under the IOC's "Olympic Agenda 2020" reforms approved in December, host cities can propose the addition of one or more sports for their games. Baseball and softball were dropped after the 2008 Beijing Games and have failed in several bids for reinstatement. They would be a huge draw in Japan, even without the participation of players from Major League Baseball which has said it won't alter its schedule to accommodate the Olympics. Japan sent many of its top professionals to Beijing. Many of the sports up for consideration have applied for Olympic inclusion in the past, some multiple times. Among the sports that applied and didn't make the cut were American football, polo, racquetball and sumo. Organizers were eager to pick sports that have an appeal with youth and wouldn't require the building of new facilities. Tokyo organizers have been looking for ways to reduce costs.